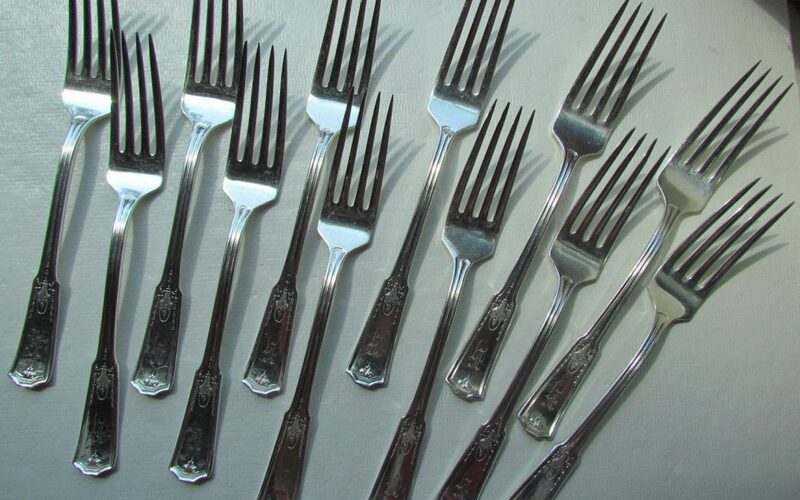 This lovely pattern is Flair, and is a lot of six dinner forks. Beautiful and strong. This silverware has been used but well cared for. The length is 7 1/2″ long. The marking on the back is: 1847 Rogers Bros. IS Flair. $5.00, plus shipping. This lovely pattern is Lilly Lilyta, made by Stratford Silver Co. It is an incredible example of artistry on a small relish/pickle/fish/cheese/condiment fork. Condition is very good for it’s age. These are hard to come by pieces, that make a statement on the table. $4.00, plus shipping. This lovely pattern is Patrician. On the back is marked Community Plate. 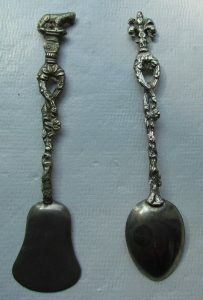 Heavy duty serving spoons. Contains a monogram letter “D”. Very nice used condition as picture depicts. $6.00, plus shipping. This lovely pattern depicts a large rose on the end of the handle. Considering it’s age, it looks brand new, not from 1935…outstanding. measuring 9 1/4″ in length, this attractive piece would compliment many special occasions. The winning bidder will enjoy this special piece. $7.00, plus shipping. This lovely pattern is called Shakespeare. The maker is Stratford. These are in very nice condition considering their date of origin: 1924. 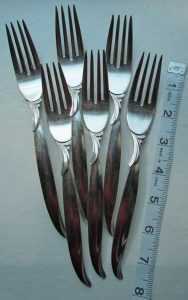 This comes as a set of 12 dinner forks, measuring 7 5/8″. 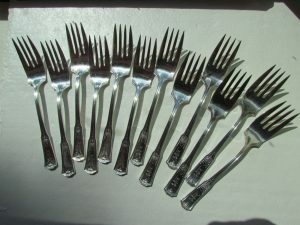 There is one fork with a bent tine, I have shown pictures of this. The rest seem to be very good without this problem, but it is nice to have a set of twelve. Monogrammed. $12.00, plus shipping. This lovely pattern is called Shakespeare. The maker is Stratford. These are in very nice condition considering their date of origin: 1924. 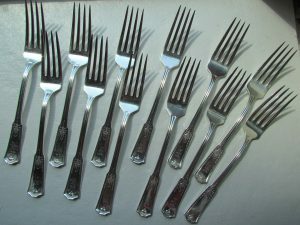 This comes as a set of 12 pie/dessert/salad forks labeled Special next to Stratford Plate, measuring 6 1/4″. It is nice to have a set of twelve. Monogrammed. 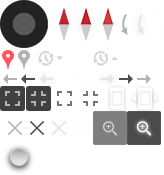 More pieces to come. $12.00, plus shipping. This lovely pattern is called Shakespeare. The maker is Stratford. 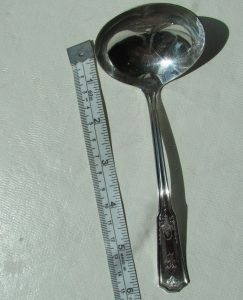 This gravy ladle is in very nice condition considering their date of origin: 1924. This matches the set I am now listing, with some more to come. This piece measures close to 6 1/4″. Nice everyday special piece, holiday necessity. Monogrammed. $5.00, plus shipping. This is a lovely pattern with delicate floral, leaf and shell design. Labeled International Deep Silver. $4.00, plus shipping. These two pieces are souvenir pieces made in Italy. They are ornate and old. Very fun decorative pieces. $4.00, plus shipping. This lovely pattern is French Lily made by GAB. This serving spoon is hallmarked with 3 royal crowns, an S (Which in this case means sterling), R7, and another hallmark I can’t make out. Monogrammed. 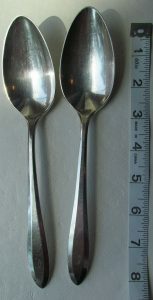 Measures 21.5 cm. This pattern has been around since the 1800’s. New, this piece retails $157.00. This is a wonderful piece to add to any collection. The weight of the spoon is about 2.5 ounces. $50.00, plus shipping.